Honeysuckle has been one of my favorite flower friends since I was but a wee pixie. 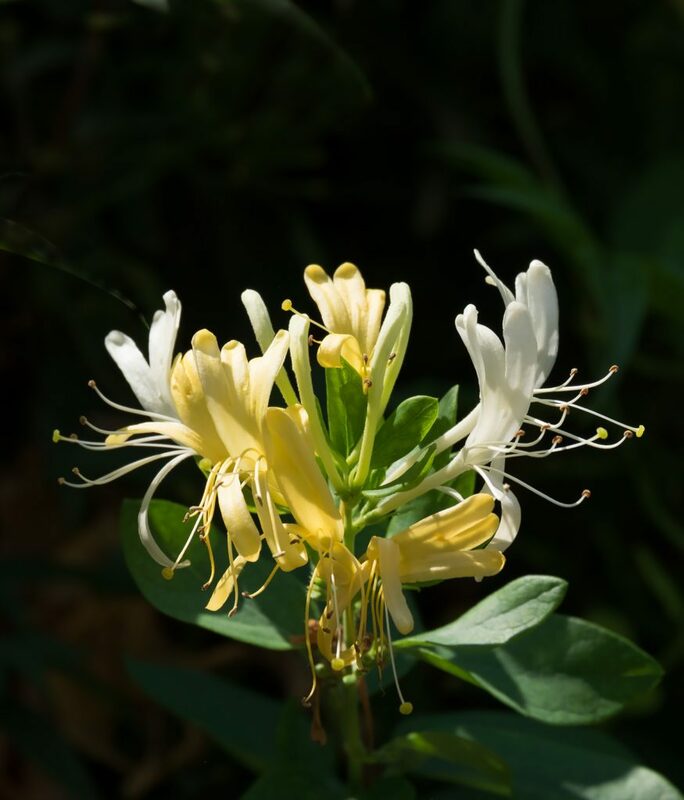 There was a special bush, an old-growth clump of honeysuckle that grew tall and then draped over towards the ground like a willow or a weeping cherry. It was a magical place in the corner of my grandparent’s suburban yard where I could go and hide from the bright sun, gaze up at the blue sky through the green and white haze of leaves and flowers, and listen to the low, slow buzzing of the other species who supped from flowers as I did. Sticky-fingered and sunburned, I’d retreat indoors later in the afternoon like a besotted bee drowsing back to the hive at the end of the day. Now that I have my own lawn to tend, I am somewhat concerned about the amount of honeysuckle that I see. This lovely plant is one that grows very quickly and overtakes everything it touches, rather like kudzu. Therefore, I am unashamed at how many honeysuckle flowers I harvest. Whenever I have anger bubbling up inside, I’ll take it out on the ever-encroaching wave of green vines that surround my little yard. Harvest honeysuckle flowers! This is the fun part. I have a stand of Pampas Grass in my yard where the honeysuckle vines climb like madmen in early to mid Spring, and that yielded the six cups I used for this recipe. Watch for buggies, don’t forget to wear sunscreen, and expect the neighbors to slow down and look at you quizzically as you forage. As the sweet pollen nestled into the white velvet flower cones is so delicate, I prefer to go without rinsing the flowers before using them. Before you get grossed out by the idea of dirt or buggies, don’t worry – we’ll make sure the end result is bug-free. Process the flowers by chopping off the green bits (sepal) and putting the flowers in a gallon pot. Grab another large stockpot and add about 2/3 of a gallon of water. Allow it to come to a boil and remove from heat. When the water is at a steady, rolling boil, remove it from heat and add the sugar. Stir it carefully until it is all dissolved. Pour the hot syrup water over the flowers and raisins in the other pot, put a lid on, and let the it steep for at least an hour. While it is steeping, sanitize your gallon carboy, airlocks, bungs, and funnel with a store-bought sanitizer, or try a bleach and water mix. Make sure you rinse it well afterward, especially if you use bleach! Once the honeysuckle must has steeped and cooled down a bit, set the funnel in the neck of the carboy and set a strainer inside the funnel to catch the flowers (and bugs!). Pour your delicious honeysuckle nectar into the carboy. Add more clean, filtered water until the must is up to the neck of the carboy. Add in the bung and the airlock to keep everything clean. Allow the must to cool down to body temperature before you pitch your yeast – since it is a gallon batch, I tend to add just a pinch or two of bread yeast (or whatever brewing yeast I have on hand). After a month or two, the fermentation will slow down to one wee bubble every 30 seconds or so. At that point, I often choose to taste the brew to see how it suits me. If it needs more sweetness, I’ll rack the brew over to a new carboy and add some sugar or honey syrup to get it where I want it. If you add sugar, let the wine sit for another day or two until you’re sure it hasn’t restarted fermentation. Next, bottle! 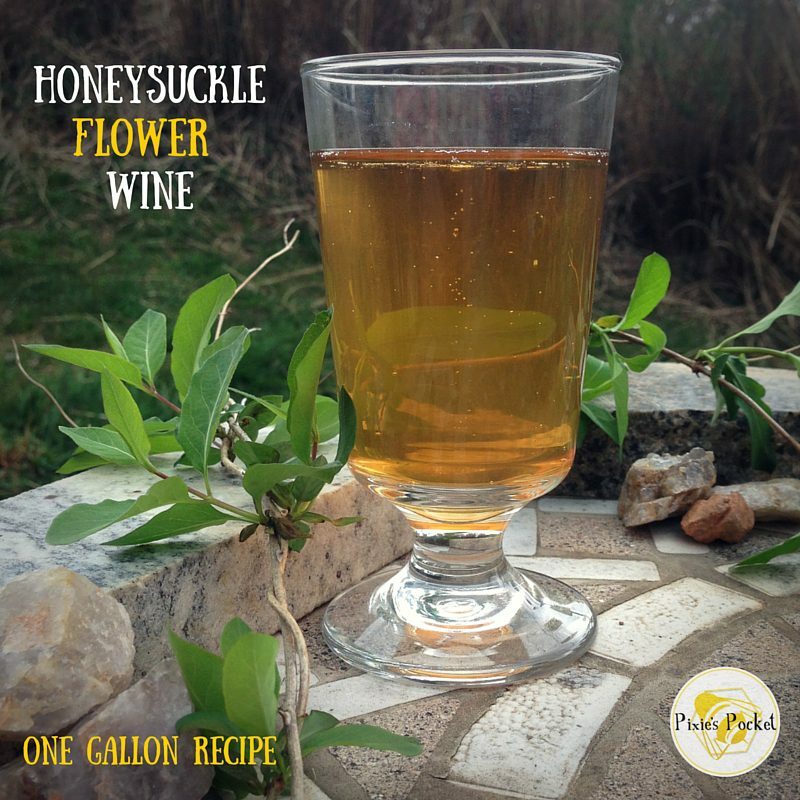 Everyone who tried my honeysuckle wine thought that it was mead! The delicate flavor and aroma of honeysuckle remain present and pleasing to the palate, even after a bit of aging. I hope that you try and enjoy this wine…well worth the sunny day spent harvesting flowers! Need more help, tips and a free guide to brewing one-gallon batches of wine and mead? Here you go! ← Things I Love: Being Busy Doing What I Love! Yipes! Good catch! 🙂 The raisins go in with the flowers, just as you pour the hot syrup water over them. Thanks for that, I’ll update the post to include that detail! Oh, and by the way, your leatherwork is BEAUTIFUL! 🙂 I’m a Rennie and Faerie festival attendee/volunteer/vendor myself, partly because of artisans like yourself. Thank you for the compliments! You make me blush! My wife and I are Rennie’s ourselves. We have started the honeysuckle wine without the raisons. It is bubbling away. We will let you know what happens without the raisons. what flowers do i pick just the white ones or any of them at different stages? Hey Don! I tend to pick the white ones mostly, but there’s a few yellow ones thrown in, too. Just avoid actively wilted ones that are going brown, that wilted flavor translates into the brew! My honeysuckle adventures involved getting to the flowers before the bees did and sucking the nectar out for myself. Even as an adult I can hardly resist. Unfortunately where I live now has no honeysuckle vines which is just as well as my son would root them out as quick as possible. Thanks for the awsome recipe! I can’t wait to try it.